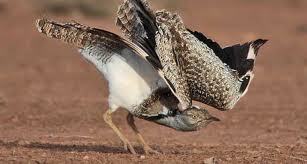 Thousands of Houbara birds from cold countries come to the desert areas in Pakistan during the winter season. However these birds do not know that they will be killed by the royals of Arab countries. These royals camp here and hunt these birds. These royals hunt these birds with the help of dozens of specially-trained falcons. Unfortunately, this mindless violence is arranged by the government of Pakistan. This year too the Pakistan government has issued 12 permits for around 815 trained hunting falcons. They include two permits for 135 falcons for the royal family of Saudi Arabia, five permits for 200 falcons for Bahrain's royal family, two permits for 250 falcons for UAE and three permits for 230 falcons for royal families of Qatar. The Pakistan Government has given most of the hunting permits to the royalty and allotted them different desert areas for it. Each permit allows 100 birds to be hunted. The royals pay the Pakistan government millions of dollars to let them hunt the bird as its meat is delicious and is considered an aphrodisiac. This state sponsored mass murder of these innocent birds is outrageous. It is quite unfortunate that thousands of birds are killed every year just for the sake of taste and adventure. The killing of birds must stop immediately. If the government of Pakistan needs to earn money, it should use its national resources and not kill innocent birds. What a shame!